They have offered solutions for specific water treatment to homeowners, pool professionals, water parks, resorts, and more. These are earth-friendly products that are used to prevent and improve water quality. Everyone wants to have crystal clear pool water. Why not keep up to date and improve your water clarity by adding safe and effective products. 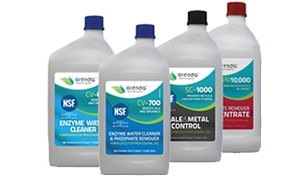 Orenda Technologies are committed to using their enzyme technologies to treat all types of recreational bodies of water. These changing ways are to control the amount of chemicals added and use earth friendly solutions to help maintain that perfect water balance. All though the maintenance is sometimes tough, its best to have a routine. Keeping up with this routine is the secret to beautiful, healthy, refreshingly clean water. Listed are some additive agents that Orenda Tech offers. Most are offered in multiply sizes that can accommodate any residential or commercial application. They are proud to offer such award-winning formulations that implement environment-friendly chemical technology. Orenda offers some instructions on opening and close your pool per season. These can be costly measures that can be avoided with taking the time to do simple seasonal steps. Open/Close kit is a non-chlorine kit using Enzyme technology along with Phospate Remover and Scale & Metal Control. This kit is approved to treat approximately 10,000 gallons of water. The three products in collaboration will provide exceptional contaminate removal along with providing a protection for plaster. Step 2: Fill pool to middle of tile line and turn on equipment. Step 3: Check all chemical levels and adjust accordingly to industry standards. Do not super-chlorinate. Step 4: Add the following. Allow the pool to circulate for 24 hours. Step 5: Vacuum, Brush, and Net the pool after the 24 hours of circulation. Backwash the filter after vacuuming if necessary. Step 6: Recheck chemical levels and adjust if necessary. Step 2: Add the following. Step 3: Brush and net the pool after the 24 hours of circulation. Backwash and clean the filter after vacuuming.